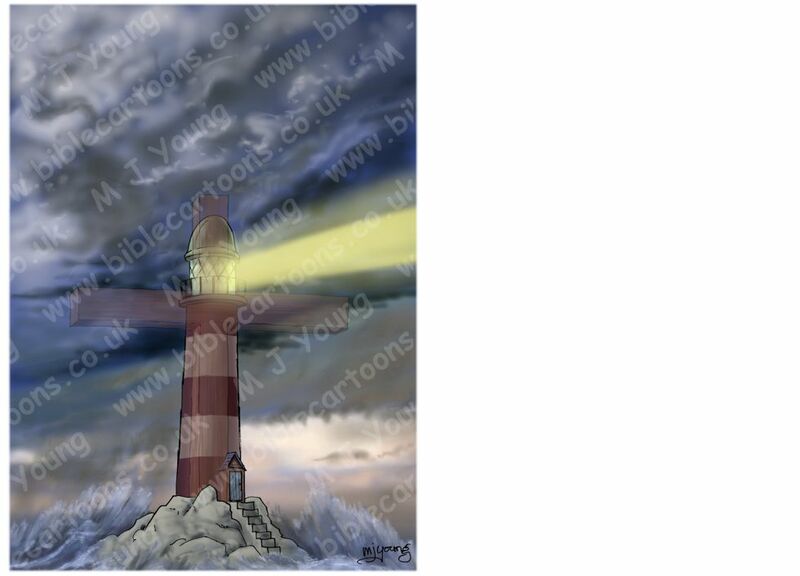 The cross of Jesus as a lighthouse metaphor picture. Unusually (for me!) I have drawn this scene in portrait format, rather than landscape. To make it fit on this gallery page, I have included an invisible white background, so it has the same dimensions as all other images in the gallery page. Please note: the file that is provided for download (free or paid) is portrait in orientation and does not have the invisible white background on the image seen above. This picture came from someone in the congregation at Fore Front church (where we attend) on the same day as the Telephone exchange one. 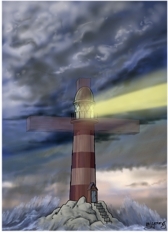 The idea is that the cross of Jesus “shines” in darkness, showing us the way to go (in life) much like a lighthouse guides ships & helps them to find there way. I was very pleased with the way the sky came out – I really enjoyed colouring this picture! Sermon/teaching theme suggestions: Amongst many other things the cross is about love & self-sacrifice. This picture could be used to illustrate the way in which the cross of Jesus points us in the right direction: towards self-sacrifice for the good of other people. It could be used to show that we live in a dark, stormy world, full of difficulty & turmoil, but that, even in the midst of all of that, the cross of Jesus “shines” out to us, to guide us safely to the “harbour” of God & His amazing love.